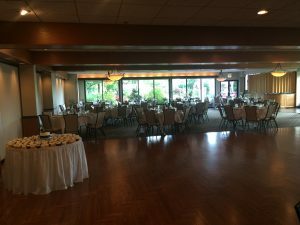 From ceremony to reception, Felix and Fingers performed an amazing and successful show for the Silver Lake Country Club wedding. Everyone in attendance had a BLAST! 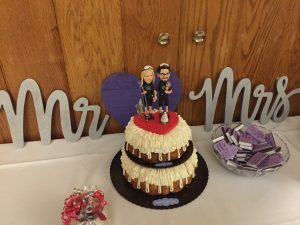 Congratulations Karen and Allen! Silver Lake Country Club is a venue Felix and Fingers have performed at many times. This country club is located 20 miles south of Chicago and is the perfect venue for any public or private event. Outdoor weddings in July can bring the heat. The bride and groom set out vintage metal bins holding wooden fans. 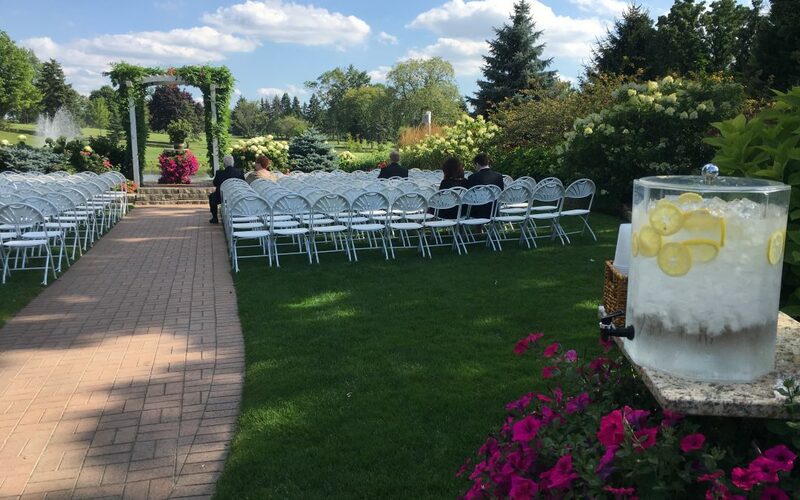 It wasn’t long before guests were fanning themselves under the shade of the willow trees. Furthermore, we LOVED the built-in outdoor sound system. A rare treat for wedding venues. Karen and Allen had a cousin sing for part of the ceremony. Something we are always happy to accommodate! If you would like to tour the Silver Lake Country Club please click here. 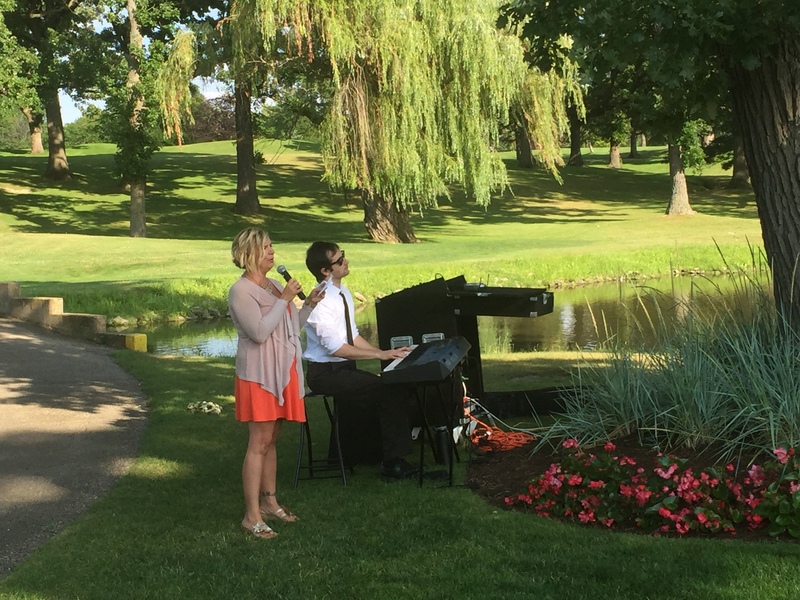 Our performers for the Silver Lake Country Club wedding were Mike Sherman and Mike Potts. After an exchange of vows, guests were moved into the West Garden Room. 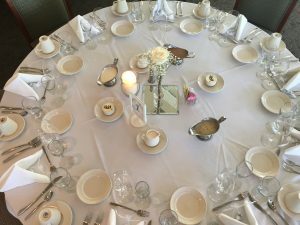 With floor to ceiling windows, everyone was treated to spectacular views such as lush gardens, beautiful flower beds, a waterfall and gazebo patio. Felix and Fingers started off cocktail hour playing I Choose You by Sarah Bareilles, our first request of the evening. Butler passed hors d’oeuvres of smoked oysters and cucumber sandwiches were a hit. We loved both! With an excellent staff on hand, no detail was overlooked. During dinner Felix and Fingers had everyone in on interactive games such as Name That Tune and Eye Spy. We also had a chance to enjoy a super tender filet alongside the largest, fattest baked potato we’ve ever seen! Right after formalities (speeches, dances, more speeches), our performers moved EVERYONE to the dance floor with one song. As a matter of fact, instant zombies appeared everywhere by the second note of Michael Jackson’s Thriller. We noticed the Teenaged Mutant Ninja Turtles were missing from the top of the cake. Apparently a group of youngsters hijacked them and were playing with them on the dance floor. Prior to the show, our performers handed out song request sheets and our pianos were instantly LOADED with great requests. We had a blast making sure everyone heard their song. A favorite of ours, The Electric Slide, had the room looking like a 70’s music video! Above all, we love an audience that is willing to participate. This is when our performers pushed cardio with Rasputin by Boney M. The crowd went WILD. Felix and Fingers may or may not have played Pokemon Go after tearing down following the wedding. Hey, what can we say? We love FUN! In conclusion, this was a high energy gig that had everyone on their feet dancing and singing at the tops of their lungs! Since Felix and Fingers perform an all ages show, it was great seeing the little ones on the dance floor having fun. If you’d like Felix and Fingers at your next event send us an email to info@felixandfingers.com or for more info on our site please click here. We look forward to hearing from you soon!